Contrary to popular opinion bananas are not just monkey fodder. They are actually very good for you helping with digestion, boosting our brains, alleviating morning sickness, offering protection against diabetes, kidney cancer, osteoporosis and macular degeneration. You can even use them around the home with a number of useful hacks. 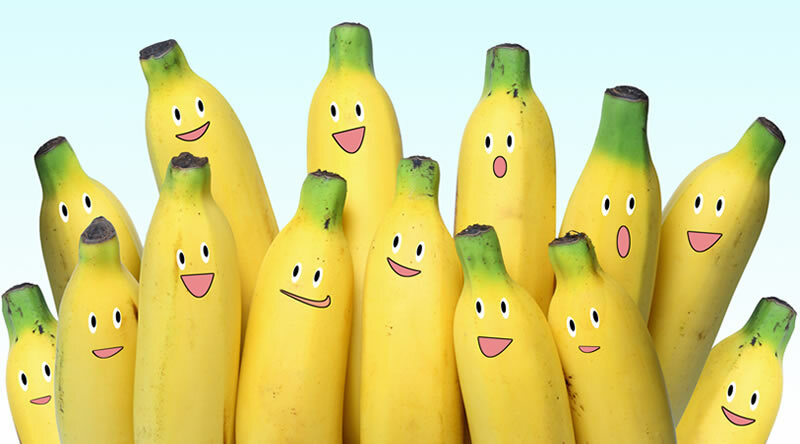 If you’re feeling stressed, eating a banana can help to make you feel happier due to the high levels of tryptophan which, when converted to serotonin, produces stress-busting relaxation. Being high in potassium, a banana also helps to reduce your blood pressure which helps prevent heart-attacks and stroke. In addition, potassium is useful when you need to remain alert – a banana can help you get through that important exam! They contain lots of vitamin B6 which can help your immune system produce white blood cells to fight infection, and strengthen the nervous system. Bananas can also help with the regulation of blood sugar for diabetics, aid weight loss and reduce swelling. Bananas can also help those who are trying to quit smoking. Eat bananas can help mitigate cravings – potassium and magnesium along with vitamin B can help with withdrawal symptoms. Planning a work-out? Eat two bananas beforehand to give yourself an energy boost and protect against muscle cramps and build strong bones, due to their calcium content. They also contain iron and are a very useful food supplement to help guard against acid reflux by acting as a natural antacid, protecting any stomach ulcers by coating the lining of the stomach against corrosive acids. Finally, don’t waste the skin. Before going out, polish your leather shoes by simply rubbing the inside of a banana peel all over and polish up with a dry cloth – instant shine! Dispose of the remaining peel by throwing it in your composter and use in your garden. It’s now time for you to go bananas!